Is Brooklyn the 4th Largest City in the US by Population? One often hears that Brooklyn would be the 4th largest city in the United States if it were an independent city. Is this still true? The answer is yes. Brooklyn, NY, if independent, would be the fourth largest city in the United States. In fact, at the rate that Brooklyn is growing, it may even surpass Chicago and become the 3rd largest city in the United States. In population terms, Brooklyn, NY would be the 4th largest city in the United States were it an independent municipality. But Brooklyn, NY isn't of course, an independent city. It has been a borough of New York City for over a century and is likely to remain so! What is the population of Brooklyn? 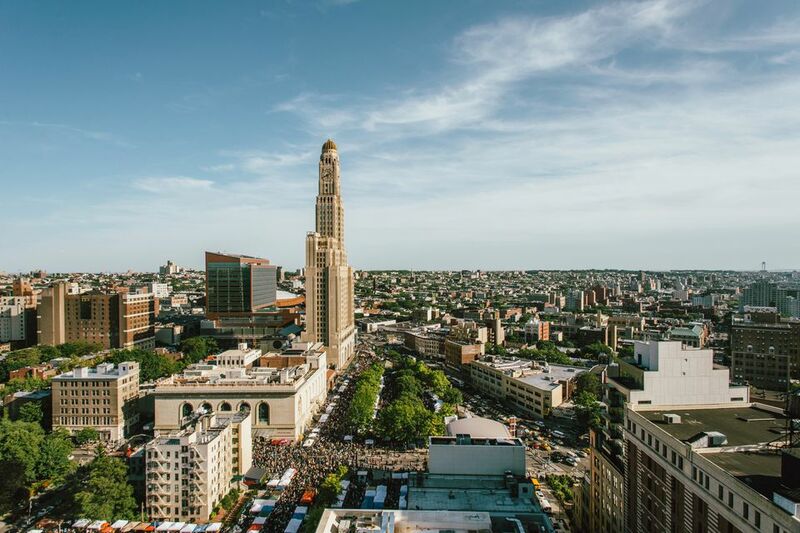 According to the New York Post, "The number of people living in Brooklyn has spiked more than five percent from 2.47 million to 2.6 million since 2010—and it’s only getting hotter, according to a US Census Bureau estimate." Brooklyn, like the rest of NYC, is a melting pot. With Russian bathhouses, Chinese food markets, Italian markets, kosher gourmet stores, you can see how different ethnicities coexist within this lively and cultural borough. The landscape has also changed in the past few decades and many young urban professionals who want to raise families are selling in Brooklyn. Many of the streets are lined with strollers and shops catering to parents of young children. Some public schools are bursting at the seams and have relocated or removed their public pre-k programs. However, if you're just here for a visit, know you aren't visiting a small town, this is a big city. In population terms, Brooklyn is bigger than Philadelphia and Houston, and only slightly smaller than Chicago, but Brooklyn might surpass Chicago by 2020. Brooklyn, NY is bigger in population terms than San Francisco, San Jose and Seattle combined. However, Brooklyn isn't its own city. For years Brooklyn stood in the shadow of Manhattan, but now Brooklyn has emerged as an apex of creativity and is home to many artists, writers, etc. In recent years, art galleries, museums, and cultural centers have opened throughout the borough. Brooklyn has also become home to three new sports teams including the Islanders. If you want to compare, the population of Denver is one-quarter of the population of Brooklyn, NY. New York City (even without Brooklyn) is the largest city in the US, followed by Los Angeles and Chicago. Here's an alphabetical listing of the 25 largest cities in the US. On your next trip to Brooklyn, you should allot enough time to see the borough properly. Check into a hotel or use this itinerary if your schedule only permits a weekend jaunt to Brooklyn. Enjoy your time here, and remember, since it's larger than San Francisco, perhaps you should allot a few more days to explore this vibrant section of New York City.